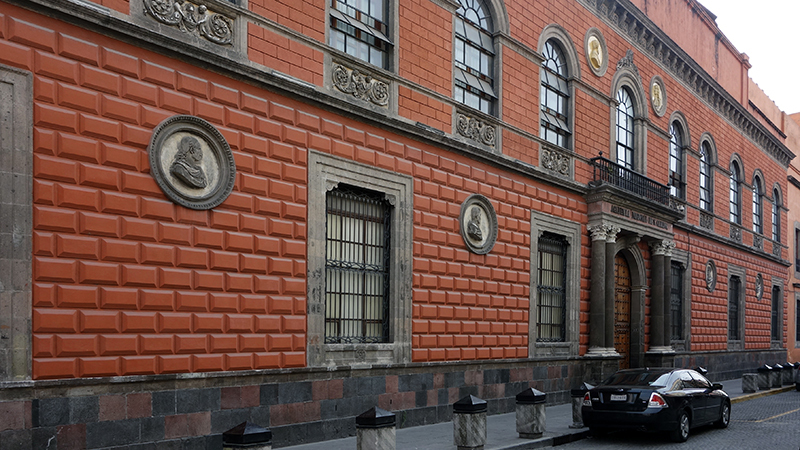 Did you know that the first art school in the Americas was established in Mexico City in the late eighteenth century? Creole artists (of European descent born in the Spanish Americas) in preceding decades had failed to convince the Spanish king to create a pedagogical artistic institution. Nevertheless, by the end of the eighteenth century, the Royal Academy of San Carlos (Real Academia de San Carlos) was established. It was modeled after the Art Academy of San Fernando in Madrid, and consequently, a new chapter of Mexican art history began. 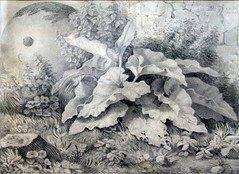 This important school fostered Romantic and Neoclassical aesthetics through previously unexplored genres of painting. 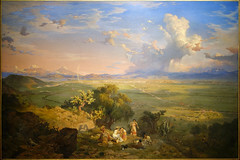 For example, beginning in the nineteenth century, students emerging from the new school at the Academy began to illustrate local vistas of the Valley of Mexico. 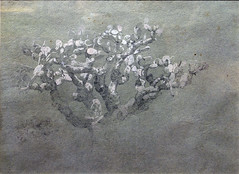 The development of these images offered the perfect opportunity for artists to explore the Romantic qualities of “pure landscape,” which in Mexico, through the teachings of the Italian professor Eugenio Landesio, emerged as a popular genre in the Academy. 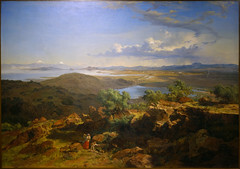 However, and as observed in Velasco’s The Valley of Mexico from the Hillside of Santa Isabel (above), the valley represented much more than a mere opportunity to practice this newly established genre of painting. This imagery offered an opportunity to highlight symbols of patriotism valuable to a newly independent society. After the 1821 war of independence (from Spain), Mexico sought to establish its identity through artistic endeavors. The development of the practice of national landscape painting was part of the dictator López de Santa Anna’s efforts to re-establish the art academy after decades of neglect following the formation of Mexico as an independent nation. 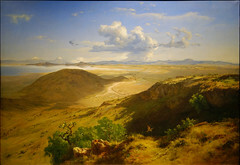 The Italian artist Eugenio Landesio (who was a well-regarded artist in Mexico) was appointed as the academy’s professor of perspective and landscape painting in 1855. His mentorship and his experience uniting ancient and contemporary Roman historical subjects in his canvasses forever changed the history of Mexican landscape painting. 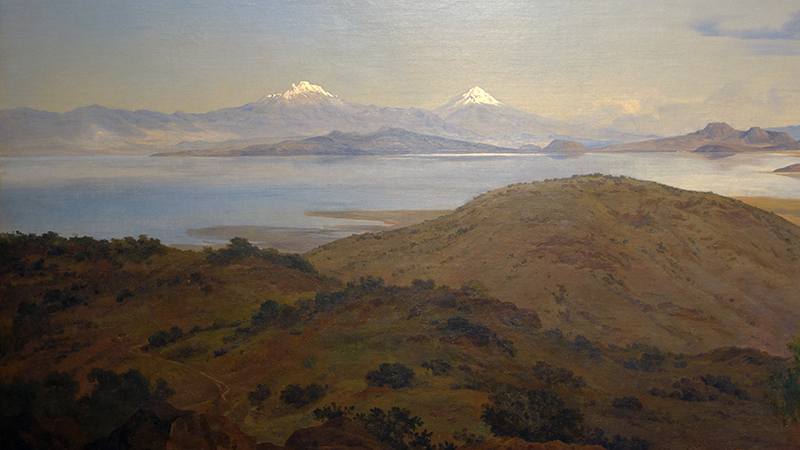 While Eugenio Landesio and his contemporaries had created similar landscapes of the Valley, Velasco presented a monumentality and an open quality to his images that surpassed compositions such as El Valle de Mexico desde el Cerro del Tenayo (above) created by his Italian mentor only a few years earlier. 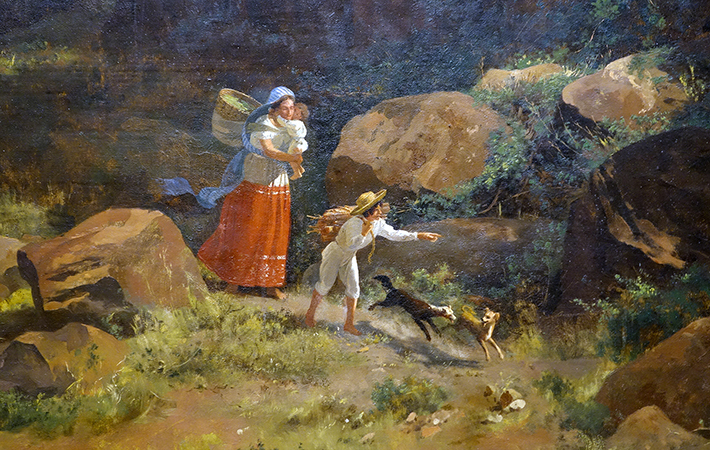 Velasco’s compositions united pre-Hispanic symbols and contemporary national sentiments. For example, the white peaks that predominate his vistas are the Popocatepetl and Iztacchihuatl volcanoes. For centuries the land’s romantic topology has captured the imagination of Mexicans. Prior to the arrival of the Spanish to the Valley of Mexico in 1519, these two volcanoes were the main characters of a legendary ill-fated love between an Aztec princess (Iztacchihuatl, or “white woman”) and a courageous warrior (Popocatepetl, or “smoking mountain”). 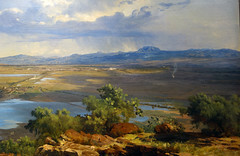 Towards the composition’s background, the spectator can admire the receding waters of Lake Texcoco and the contours of Mexico City. The ancient Aztec capital of Tenochtitlan was founded in the middle of this lake in 1325. 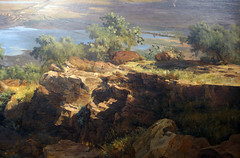 This was a familiar site for Velasco, given that the artist’s home was located at the foot of the small hill shown in the middle of the canvas. This unassuming hill was also an important sacred colonial site where the Virgin of Guadalupe first appeared to the indigenous man Juan Diego in 1531. The artist is known to have painted in this location many times. 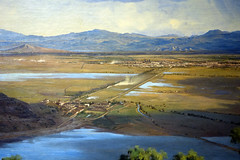 This version of The Valley of Mexico from the Hillside of Santa Isabel is perhaps the most celebrated of a dozen or so images with the same subject done by the artist between 1875 and 1892. At one point, the brushstrokes that form the peaks of the snow-covered volcanoes, the rock formations and other details were done from memory, making it possible for the artist to change and manipulate the details of the landscape as he saw fit. The Valley of Mexico from the Hillside of Santa Isabel can be viewed as a re-interpretation of the common late eighteenth-century German subject, “pastoral idylls,” where a sense of poetic harmony and daily life were united. In the tradition of artists such as Casper David Friedrich (above) and Joseph Anton Koch, Velasco introduces his figures (below) not as mere staffage, or accessories enhancing the rest of the artwork, but as key components behind the composition’s poetics. 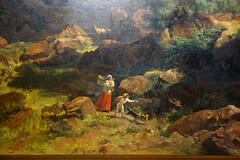 Similar to his German predecessors, Velasco explored the romantic relationship between human figures and the scenery they inhabit. Two indigenous individuals are presented in transit from the city to the country, reflecting a romantic, yet difficult socio-economic relationship between people and their ancestral land. The figures’ indigenous garments intrinsically relate to the national iconography displayed throughout the image. 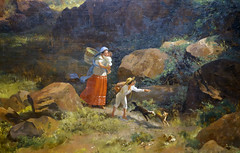 In the words of the German poet Johann Christoph Friedrich von Schiller, the figures in a landscape must represent “a humanity reconciled with itself…nature purified, raised to its highest moral dignity…the ideal beauty applied to real life.”¹ Velasco has produced an image where national pride, romantic poetry, and daily life blend to transform the Valley of Mexico into a Romantic masterpiece. Overall, The Valley of Mexico from the Hillside of Santa Isabel represents an important period in the development of Mexico’s national identity and an important chapter in the history of Mexican art. 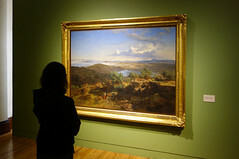 Velasco’s landscapes became symbols of the nation as they represented Mexico in several World Fairs. The union of romantic European sensibilities and the historical allegories observed in his compositions won him important recognition in Chicago, Paris and Philadelphia in the late nineteenth century. 1. 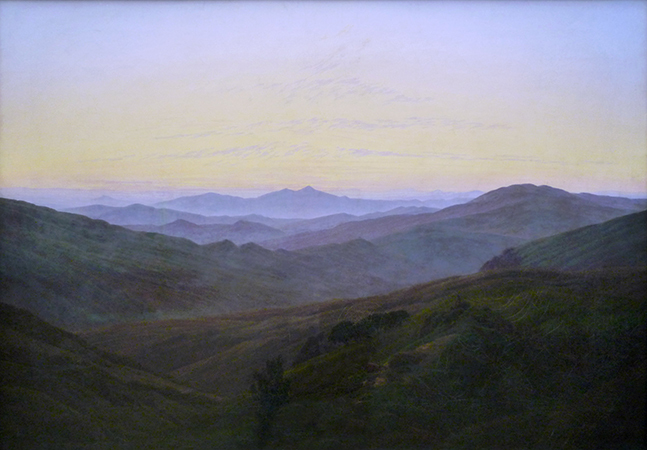 Hilliard T Goldfarb, “Defining ‘Naive and Sentimental’ Landscape Schiller, Hackert, Koch, and the Romantic Experience,” The Bulletin of the Cleveland Museum of Art , vol. 69, No. 9 (Nov., 1982), pp. 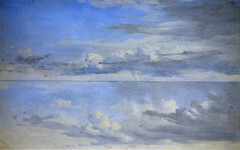 291. 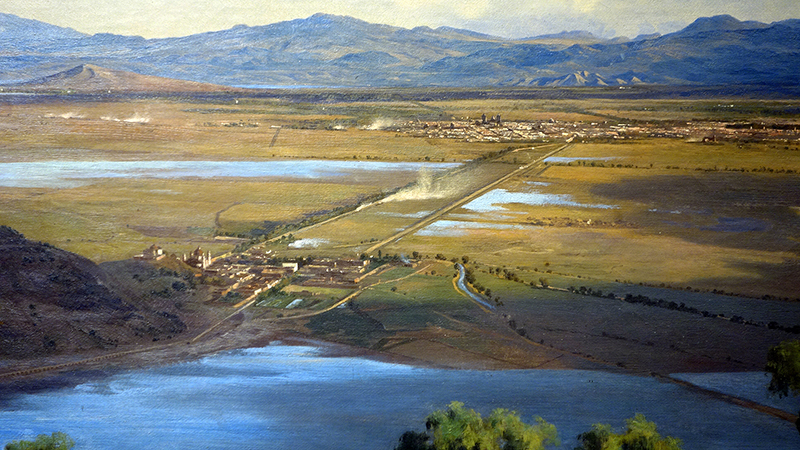 Cite this page as: Emmanuel Ortega, "José María Velasco, The Valley of Mexico from the Santa Isabel Mountain Range," in Smarthistory, August 9, 2015, accessed April 24, 2019, https://smarthistory.org/velasco-the-valley-of-mexico/.